People struggling with a disability know that every day can present new challenges. Earning money, maintaining a home, or just getting around can be a daily struggle. For many people, these difficulties are compounded by the fact that they have outstanding student loans. Collection efforts and loan payments add unhealthy stress to an already difficult situation. The major news outlets focused a lot of attention on the story that President Obama was forgiving the federal student loans of some nearly 400,000 people who deal with a disability. 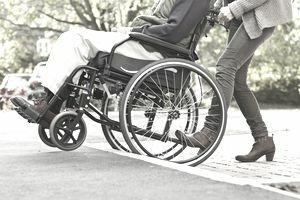 The Department of Education is sending out letters from its Total and Permanent Disability Servicing Unit to borrowers that it has identified as being eligible according to information provided by the Social Security Administration. The process has been simplified somewhat from the standard procedures, and loan payment requirements have been temporarily suspended. It may sound like this is some big announcement, but the surprising part of this news is that the disability discharge program has been available all along. The problem is that many borrowers are simply not aware of its existence, and do not take advantage of the benefits it offers. So the administration is now taking the additional step of searching Social Security records to identify potential applicants. If you are disabled but did not receive a letter a letter from the Disability Servicing Unit, it may be because the Department of Education does not have current contact information for you or you may not be identified by Social Security as being disabled. In either case, it is still worth trying to ​determine whether you are eligible for loan forgiveness. Who is eligible for a disability discharge? Veterans with a service-related disability might be eligible for loan forgiveness. People receiving Social Security Disability Income can apply to have their student loans discharged. You may also be able to have a physician certify that you meet the specific criteria regarding disability. Appropriate documentation must be submitted to support your disability claim, and each case will be reviewed individually. Starting the process: The Nelnet Total and Permanent Disability Servicer assists the Department of Education in administering this program. You can notify Nelnet that you are interested in being considered for a student loan discharge by phone or email, but the simplest way is to visit the disability discharge website and begin the application process online. Nelnet will then contact your loan holders and instruct them to suspend collection activity efforts on your student loans for a period of up to 120 days while your application is being considered. Using a representative to submit the application: Some disabilities may preclude a potential applicant from completing or submitting the necessary application. In those cases, a designated representative may initiate the review process. A completed Applicant Representative Designation form must be submitted to Nelnet before they will work with your representative. What happens if an application is rejected? Your appeal process can vary a little, depending on what approach you are using to prove to the Department of Education that you are totally and permanently disabled. In general, though, you will receive a written notice of denial and your loan servicers will be instructed to resume collection activities. The letter will include a reason for the denial and will also provide specific details on how you can submit additional information or appeal the decision. Be aware that this program applies only to federal student loans. Borrowers of private student loans will still need to check with their individual servicers to determine if they offer a similar program. In addition, the amount of the loan discharged may be considered income for federal tax purposes and some state taxes. Most people who are disabled and receiving Social Security, however, are in a lower tax bracket and it might not have a significant impact. In any case, a one-time hit for tax purposes is far better than continuing to struggle with loan payments. If you are disabled and cannot meet your payments, the program is worth investigating to determine your eligibility.